What is Oral Pyogenic Granuloma? 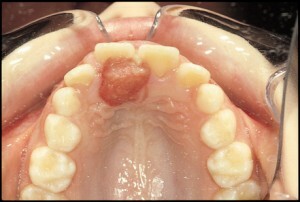 Oral pyogenic granuloma is a relatively common lesion that appears in the mouth as an overgrowth of oral tissues. 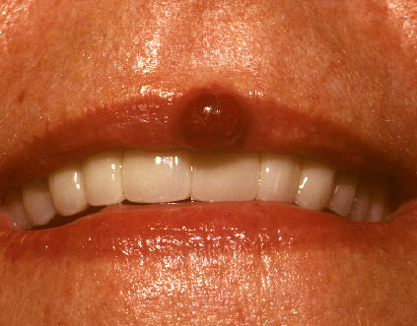 Often also known as “Granuloma gravidarum” and “Pregnancy tumor“, it can be found elsewhere on the surface of skin and involve the septum of the nose. The term “pyogenic granuloma” is misleading because it is not a true granuloma. It was originally applied because the identical lesion on skin was thought to be a reaction to infection by pyogenic (pus producing) organisms. In actuality, it consists of many dilated blood vessels in a loose swollen connective tissue stroma, which is often quite prone to bleeding. When does oral pyogenic granuloma occur and who is affected by it? The lesions occur over a wide age range but females are more likely affected by oral pyogenic granulomas than males with a peak incidence in females of child-bearing age. Lesions occurring in pregnant women can arise at any time from the first to the ninth month, although onset is usually seen around the end of the third trimester. Although the majority of oral pyogenic granuloma in mouth is seen on the gums, more often in the front region of the upper jaw, the lesion can occur at other sites, for example the tongue and inner cheek as a result of trauma. Pyogenic granuloma and pregnancy epulis are relatively soft, deep reddish-purple harmless single swellings on the gums which are often extensively ulcerated. 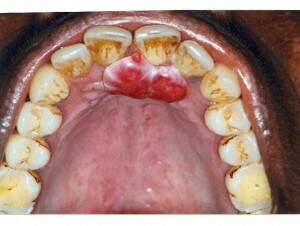 Pregnancy epulis is regarded as pyogenic granuloma on the gums occurring in a pregnant female. Usually no larger than 2 cm, the granulomas are painless and may bleed readily on its own or if disturbed. The distinction between these two lesions is purely clinical for they resemble each other under the microscope. They gradually increase in size, but may regress spontaneously or decrease in size after delivery of baby and become fibrotic. Pyogenic granuloma during pregnancy or pregnancy tumors are single, tumor-like, soft tissue growths typically seen on the gums region between teeth and usually seen with associated pregnancy gingivitis (inflammation of the gums). They are attached via a stem with intense red to deep purple color, depending on the blood supply of the lesion and the degree of blood stagnation. They usually regress after delivery of baby and are often related to poor oral hygiene. Furthermore pregnancy graunulomas are attributed to the general effects of progesterone and estrogen on the host immune system. Peripheral ossifying fibroma and peripheral giant cell granuloma, are clinically identical to the pyogenic granuloma when they occur on the gums though oral pyogenic granuloma is the more common lesion of the lot. The pyogenic granuloma can occur anywhere in the mouth, whereas the peripheral ossifying fibroma and peripheral giant cell granuloma only occur on the gums or on the soft tissues covering the jaw bone. All three lesions share the same appearance, treatment and prognosis. There is usually no treatment for oral pyogenic granuloma during pregnancy since the lesion may heal spontaneously or decrease in size after delivery of baby. Management of the lesion is to wait until after delivery for surgical removal as control of bleeding may be difficult after pyogenic granuloma removal but fibrosis of the lesion, following birth of the child, reduces the problem. However situations may dictate immediate removal when the granuloma is painful, when it disturbs the position of teeth, when it bleeds easily or for aesthetic reasons. Recurrent bleeding pyogenic granuloma is controlled by cauterization (sealing of the ends of the blood vessels using heat or freeze to coagulate blood). If surgical removal is necessary, it is best to remove it during the second trimester because of the low risk to the fetus during this time period. The recurrence rate is higher for oral pyogenic granulomas removed during pregnancy therefore an additional surgical procedure may be needed after delivery. Besides pyogenic granuloma surgery, the dead tissues on the affected area are cleared and professional cleaning (scaling) of the adjacent teeth is done to remove any source of irritation, for example plaque or tartar. Good oral hygiene should be practiced to prevent any further recurrence. Is It Safe to Have Teeth Extracted While Pregnant? 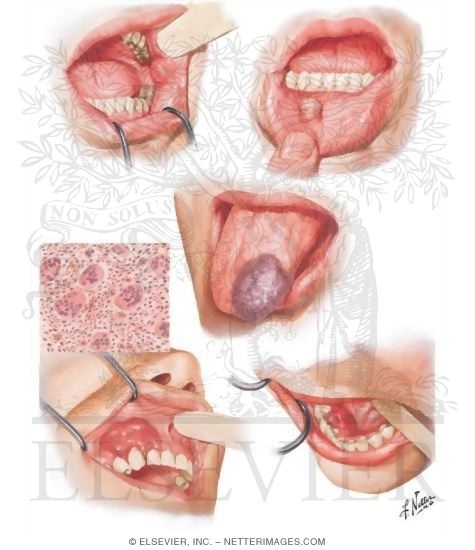 This entry was posted in Oral Care and tagged bleeding pyogenic granuloma, causes of pyogenic granuloma, oral pyogenic granuloma, oral pyogenic granuloma treatment, pyogenic granuloma during pregnancy, pyogenic granuloma on the gums, pyogenic granuloma pictures, pyogenic granuloma removal, pyogenic granuloma surgery on July 10, 2010 by oileng.